Passenger dwell time is precious! The lady at the check-in counter of Jet Airways, India’s premier airline told me that I just need to show the Boarding Card at the Lounge – they would scan and identify the passenger, rather than providing a Lounge Voucher separately. I was wondering if they were saving paper (Go Green, Save Environment, or one of those fundoo stuff). But actually, it was a smart way of using technology by using a scanner. QR Codes seem to be the rage all over and I now have mine for various purposes – try one of these below. Will write more about the utility of QR Codes to Retailers soon. As I was walking towards the Security Gates, I was remembering something that my friend Patrick Graf, Head of Retail Marketing & Services at Zurich Airport used to tell me often about one of the best practices followed at his airport – of how Shopping Vouchers were given to passengers at the time of Checking-In. It was indeed a smart way of engaging passengers and guiding them to the Retail / F&B areas rather than pushing them into those Lounges – if they have dwell time (in airport parlance, its the idle time, rather productive time available with passengers before boarding their plane), then we might as well use them at the numerous shops and restaurants. In fact, these are the guys who travel frequently collect air miles, are on the top levels of airline loyalty programs (such as a Platinum Member or Gold) and have very little time to shop for themselves or their loved ones. I saw just that today at the Carnation Lounge in Mumbai Airport – a 200 sqm facility with over 100 covers and the place was full between 18.30 – 20.30 (I had reached the airport early for a meeting which was cancelled by the other party). Apart from my professional commitments, my favourite past time is to observe consumers (and potential ones too) and was just doing that. There were atleast 7 people that I spotted in the lounge who were fiddling with their iPads; almost everyone of them had a BlackBerry and a Laptop; over a third of them were in formal business suits; and there was a glass of beer or some other form of alcohol at over a fourth of all tables. And they were munching the complimentary buffet sponsored by the airline while continuing their work – most professional / official I would guess. I have seen airports where the Lounges are located quite far-away and in spite of it, I have found myself waiting outside for a few of them inside to vacate so I can find a seat for myself. This is not particular to India, probably all across the world. There is a learning that we could take from some of the best practices followed at places like Zurich Airport and implement them in our own ways. After all, passengers’ Dwell time is too precious to be let off sipping a complimentary soup or reading the morning newspaper / evening tabloid at the Lounges – intelligence lies in enticing them to walk across the commercials areas – so they could also get a taste of Retail and F&B too. Now, I am gonna work on such a promotion starting shortly Watch out. Retail staffing has a long way to go! It was rather annoying that I didn’t get a refill lead for my Mont Blanc Pencil at the flagship store of the brand at the iconic UB City in Bangalore. The Sales staff, who was amicable and friendly ensured that the Mont Blanc service levels (as is globally) are maintained. What she didn’t do (and possibly, inadvertently) was accuracy of her technical skills. When I visited the store again the next day, another staff who was equally amicable and friendly explained that there were already spare leads within the writing instrument and that there was a mechanical issue due to which it wasn’t working properly. After a few permutation and combinations, he somehow managed to make it work! Well, I was impressed that my pencil was working normally but certainly not about the service levels at a store of one of the most respected brands in the world. In both the cases, there were no efforts made by the staff to show something new within the store – the interactions revolved around just fixing the problem rather being engaging or exhaustive. A few days ago, we went for dinner in a large group to a reputed restaurant in town, named Aangan. I believe they have a few branches across the city and was proven to be a good place all along. even as we were walking towards the store, what I saw from outside made me a bit confused – such a respected restaurant was running fans instead of air-conditioning! Yes, I agree the weather outside is rather pleasant but the overall ambience inside wasn’t so, with all the odour of food. We placed the order and were sipping our soup and the staff was already there with the main course – rotis, dal, etc. When I questioned what was the hurry, the staff replied (but politely), that “the food was already prepared”. Then a senior guy came across and took the food back (though not to the kitchen but to another table!). Now let me compare these with an example of extraordinary product / service orientation by Retail Sales staff. WSJ.com recently carried an interesting article on how Apple has ensured highest levels of customer service at its flagship stores. More people now visit Apple's 326 stores in a single quarter than the 60 million who visited Walt Disney Co.'s four biggest theme parks last year, according to data from Apple and the Themed Entertainment Association. 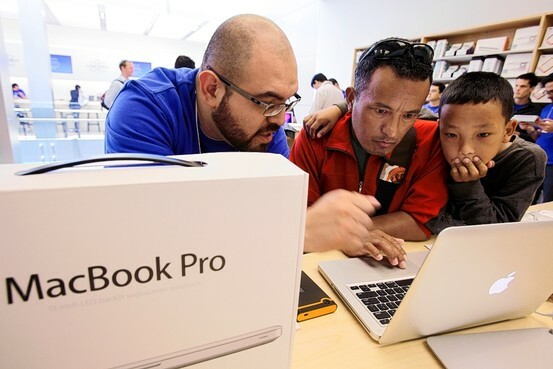 Apple's annual retail sales per square foot have soared to $4,406—excluding online sales, according to investment bank Needham & Co. Add in online sales, which include iTunes, and the number jumps to $5,914. That's far higher than the sales per square foot and online sales of jeweler Tiffany & Co. ($3,070), luxury retailer Coach Inc. ($1,776), and electronics retailer Best Buy Co. ($880), according to estimates. According to several employees and training manuals, sales associates are taught an unusual sales philosophy: not to sell, but rather to help customers solve problems. Retail staffing is one of the most complex challenges that Indian Retailers have been facing over the years. My first employer, RPG Retail had set-up RIRM – RPG Institute of Retail Management, an inhouse training & development agency in which I was a Certified Trainer. The HR Team would scout for talent from government schools and recruit them as trainees – they would be provided class room training initially and later, on-the-job training at one of its Foodworld, Musicworld and Health & Glow stores. In addition to this, they would be given a Certificate after a 6 month period of experience and a job offer to join as a full time employee. The success rate used to be over 80%, thanks to the reasonably lucrative and respectful employment that the trainees used to get. Over a period of time, they were “ready to poach” variety for newer Retailers who entered the market. Most Retailers in India today have a Training & Development Department but it’s quite a challenge to retain front-end employees especially, thanks to the lure for a small hike in salary! Most of them do not have long-term goals and hence keep jumping jobs, partially for the sake of salary and partially for other conveniences – such as proximity to their residence, designation, and not to mention shorter working hours or lower work-load. Thankfully, Indian customers at the moment are not as demanding as their western counterparts, but it is just a matter of time that they too shall be demanding superior product knowledge and high levels of customer service – from boutique stores to hypermarkets. Needless to say, retail employees would also understand this themselves, with personal experiences. More than the employers’ interest, I foresee employees (in the front-end) taking a lot more interest in training themselves – for their own long-term success and existence! FDI in Indian Retail–It’s officially political now! The Committee of Secretaries (CoS) headed by Cabinet secretary Ajit Kumar Seth is likely to meet on July 22 to finalise the blueprint of the proposal for political clearance. One of the major issues to be discussed is whether the cap on FDI should be 49 per cent or be increased to 51 per cent. At the moment, 100% FDI is allowed only in Cash & Carry formats (which excludes agricultural produce such as rice & grain, fruits & vegetables), while upto 51% FDI is allowed in multi-brand Retail formats. Last week, the Department of Industrial Policy & Promotion (DIPP), the nodal agency under the Ministry of Commerce issued the proposed policy paper to State Governments for their thoughts and invited feedback and discussions. Notably, the reactions are as expected. While the ruling UPA (led by the Congress Party) is all for allowing Retail FDI, some of its allies including Trinamool Congress, Samajwadi Party and of course the BJP which is the main opposition party are up and against the proposal. The BJP said it would oppose the move in every forum. "We're not for FDI in Retail. We believe that in the long run this move is going to harm self-employment opportunities. FDI in Retail will also adversely affect the manufacturing sector. We will oppose it in Parliament and other forums," Opposition leader in the Rajya Sabha Arun Jaitley said. The proposed policy states that Foreign Retailers can open their stores in cities with a minimum population of One million based on the 2011 Census; Of the 35 such cities in India, 10 are in states that are ruled by the BJP & Trinamool. 11 cities of the said 35 are in states that are ruled by the Congress. It is widely believed that the new policy should be allowed and tested in the top 6 cities, in which case Bangalore & Kolkata would be ruled out. That leaves with Delhi, Mumbai and Hyderabad (assuming that the State Governments would still be in power!) and Chennai (which is neither part of the UPA or the Opposition currently). Which means the possibility of Retail FDI being tested would remain with Delhi and Mumbai – the political and financial capitals respectively of the country while Hyderabad with its limited exposure to Organized Retail possibly not getting much attention, also thanks to the ongoing Telengana agitation. It is indeed quite well known that Delhi and Mumbai are the first two cities in the country to embrace anything new – from cars to culture, fashion to fun. Most of the Organized Retailers are either based out of these two cities or have their largest presence here. Indeed, Bangalore, Pune and other mini-metros are test markets for various consumer related products and services, but the money goes (as investments) and comes (as Revenues) clearly from these two cities. As of today, atleast 10% of sales across Organized Retailers would be coming from the two capitals. So, there is a lot at stake for now. Having said that, it appears that FDI in Retail would not be a battle of fundamentalist or intellectual thinking but mere political stunts. It looks like a Chess Board, where the two parties, one that’s ruling and the other which doesn’t would make their moves and counter moves based on day-today impulsive rulings, rather than maintain a long-term view. If the current Opposition comes to power in the Centre after three years, then things would possibly get more tricky, atleast based on the statements issued by them which are mostly against allowing Retail FDI. I believe my previous column on FDI last year around the same time still holds good. The benefits or otherwise of allowing Retail FDI cannot be a debate that is undertaken within the confines of the Honourable Parliament. At the same time, I wonder if it should be in the public domain, lest it would attain the same fate of the recent drama surrounding the “Lokpal Bill”. I still feel that members of the society, which should be a good mix of consumers, shoppers, Retailers, Kiranas and Government Departments should come together and discuss this issue. Wishful thinking, I agree, But leaving the decision to the Bureaucrats and Politicians would be as good as ignoring the issue in itself. As a consumer, as a member of the Organized Retail Community and as an observer of the society at large, I am as eager as many others on the outcome. Hope to see and hear positive things in the months to come! It has been the talk of the town for sometime now, the new BlackBerry Playbook, the tablet from Research In Motion.There are thousands of reviews online and I am not going to delve into it for now. I got my hands on it three weeks back (even before it was launched in India) when a friend of mine who had brought it from the US showed it to me. Pretty engaging stuff, with its plusses and drawbacks. But what interested me to analyse and write this column was an email which I received a weeks back from EZone, India’s largest electronics store from The Future Group. There were actually two, one for a pre-booking and another stating that the wait was over and the Playbook™ is Finally Here. Am sure the mailer would have gone to hundreds, or maybe thousands of email accounts and would have pulled quite a few to the store over the past few days. I myself visited a few stores of EZone and Croma (TRENT Enterprises, part of the TATA Group) over the past few days and the results were amazing! Of the six different stores that I went to in Bangalore, two didn’t have stocks – I was informed by the sales executive that the “Catchment” for that store was not expected to explore Tablets! Another store had just the Playbook and an iPad, there were no other Tablets from any other Brand. And at one of the largest showrooms of one of the Retailers, there were crowds across the store in every section and surprisingly, there was no staff to attend the curious seekers at the area that stocked “Tablets” although there were atleast 6 different brands which were available. Shoppers explored themselves (none of them were functional since WiFi was not connected) and moved on – one could imagine how many “Tablets” they would have sold today! Elsewhere in the world, in the US, you can collect boatloads of kicks™ in the kicks Reward Program and unlock awesome exclusive deals at your favourite stores. Walk into Target, Best Buy, Macy's, American Eagle, Sports Authority, Crate&Barrel, West Elm, Wet Seal and the largest Simon malls. Open the Shopkick™ app on your iPhone or Android phone in the entrance area, and wait for a few seconds. That's it! Your Shopkick app will reward you instantly. It's fun. You can get rewards at all 1,300 Best Buy and Best Buy Mobile stores in the United States, and at all Crate&Barrel and West Elm stores! And in many major cities you will find more stores with walk-in rewards, like Target, Macy's, American Eagle, Sports Authority Wet Seal and Simon Malls. Shopkick is adding more stores in more cities every month. Cool rewards like iTunes gift cards, Restaurant vouchers, Best Buy/Target/Macy's/American Eagle/Sports Authority gift cards, Facebook Credits, movie tickets, or if you go all out, True Religion jeans, a Coach handbag, or a 3D 55" Sony Bravia HDTV. And if you want to change the world, donate your kicks to 30 different causes! And all this, just to woo shoppers to walk into a Retail Store! Look at the contrast. In one country, there are not enough sales staff to manage shoppers and potential customers who walk into the store. And in another scenario where shoppers are “paid” to just visit the stores! According to the Shopkick program, as you walk into the stores, there are specific sections where you get higher kicks™ and one can keep accumulating them. There are also certain products, which by mere scanning fetches additional kicks. I did try to download the Android app in my phone, but I got a message that the app was not applicable in my country! Customer Service – the Retailer might have the products, but if they are not showcased well to potential buyers, then the conversion is not bound to happen; and not just this time, even the next time too! Sales are happening despite these, but its just a matter of time for shoppers to move to alternative avenues for shopping. An ASSOCHAM Report suggests that the expected market size of online shopping in India is about USD 2 Billion pa. Forget shoppers walking off to neighbouring stores, they may be shopping on their mobile phones and tablets sitting at the favourite Coffee Day outlets! And then, I would be writing a column on that trend, from a cafe indeed!